The Orthodox Church of St Nicholas (Kopli) is at Treiali 6, lying alongside the very last tram stop on the route to Kopli peninsula (north-west of the centre of Tallinn). The peninsula overlooks the bays of Paljassaare and Kopli on either side, and the Bay of Finland directly ahead of it. 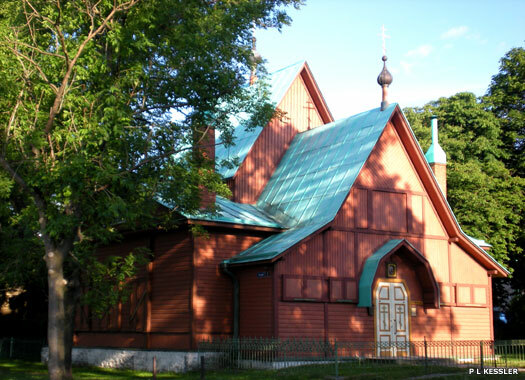 The church serves the large Russian community in the area and forms a parish within the Estonian Orthodox Church of Moscow Patriarchate. The wooden-panelled church building was consecrated on 13 November 1936 by Metropolitan Alexander (Paulus) of Tallinn and all Estonia. 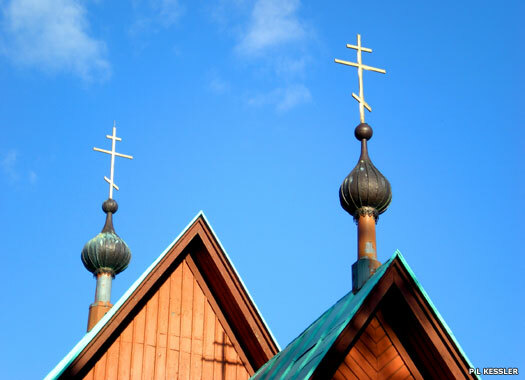 While featuring some unmistakable Orthodox additions, such as the miniature onion domes, the general style of building is typically Estonian. The church lies in a wide glade of grass and tall trees, which is part of a public footpath past the building, while the sound of the sea's waters is never very far away. 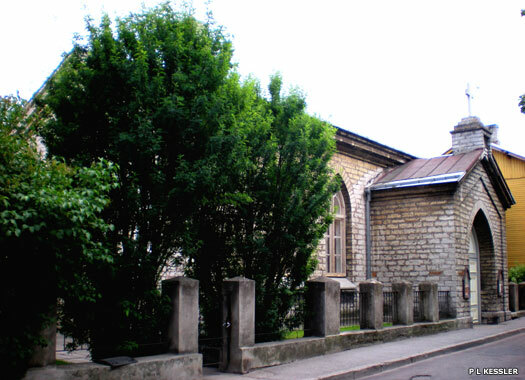 The Church of the Icon of the Mother of God, 'Joy of All the Afflicted', is hidden from view at Sitsi 15a in Põhja-Tallinn, behind a high wall and secure gates in one of the district's slightly less affluent areas, and also behind a line of low wooden buildings which are in need of repair. 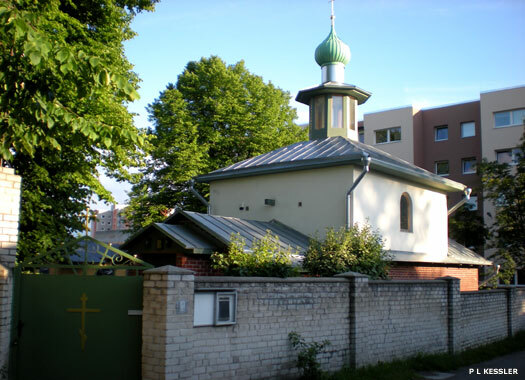 The tiny church was consecrated on 12 October 1999 by Metropolitan Cornelius of Tallinn and all Estonia (after an overhaul of the original building). Nothing is known of the church before 1999. Kalju Baptist Church is on the very quiet Kalju street in the equally quiet environs of Kalamaja (which literally means 'fish house') in the north-east of the district of Põhja-Tallinn, itself situated to the north-west of central Tallinn. The limestone church was built 1902 to a design by Konstantin Wilcken to serve the local Russian Baptist congregation - the oldest in Tallinn - and to highlight this, its announcements board is written entirely in Russian. 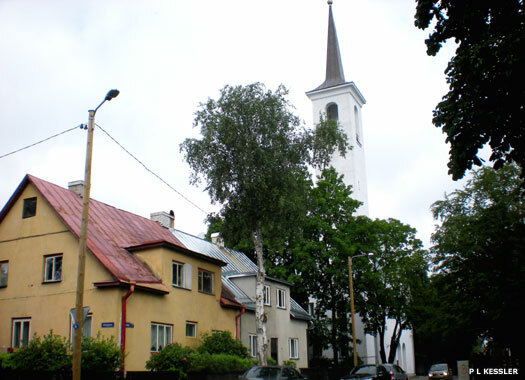 Bethel Lutheran Church (Peeteli kirik) in Tallinn is at Preesi 5/7, a quiet backstreet in the Pelguranna district of Tallinn. It is the smallest church in the capital city, being established in 1927. A decade passed by before the building of the church began when the foundation stone was laid on 13 June 1937. The first services were held in 1938, before the church was consecrated on 28 August. 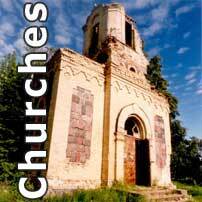 The church was forcibly closed by the Soviet authorities, but is now back in service. 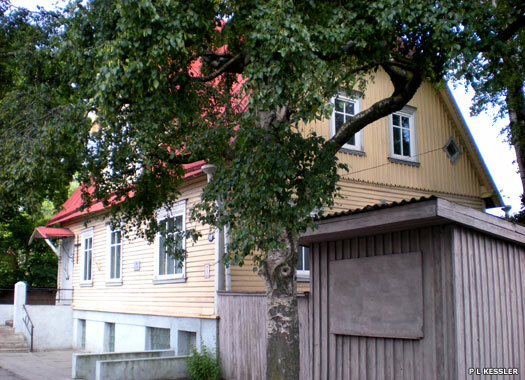 The Prayer House of the Moravian Brothers is at Endla 68 in the district of Kristiine, the only religious building here or in neighbouring Mustamäe, both of which were essentially creations of the era of Soviet Russian occupation. During the fifties and sixties, a huge number of apartment blocks were built here to cater for the large manpower stocks the Communist authorities required. Now, this small church house sits on a busy and noisy main thoroughfare. An index of churches in Estonia, which are low in number but high in uniqueness.